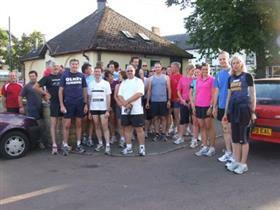 Olney Runners + Olney Multisport - a group of varying running ability all keen on keeping fit. Meeting regularly it provides a sociable atmosphere within which to get fit and stay fit taking advantage of the local countryside. They say "whether you want to run in the Pancake Race, the London Marathon, do duathlon, try triathlon or just jog around Olney before having a beer, then do come and join us". Since a first run around Emberton Park which began things, the club has achieved almost 60 marathons, organised 6 races and introduced running to many households within Olney and the surrounding area. Olney Runners is an England Athletics affiliated running club taking full advantage of the benefits which that entails. The club's website contains details of the many social events organised for members. Training sessions vary but cater for all abilities. The sessions are run by a UK Athletics qualified coach. Members are regularly on the hills but in between take in speed sessions, fartlek, pyramids and occasionally a 'hot lap' of Olney. They almost always end the sessions with a drink in the pub. On many Monday evenings there is training at Stantonbury Stadium in Milton Keynes at 7pm. Training sessions vary but cater for all abilities. The sessions are run by a UK Athletics qualified coach. See the club's training diary for more details. The group meet every Wednesday evening in Olney’s Market Place at 7pm.